Recently, Salon online magazine ran an article that speculated whether successful teaching is a nurtured talent or a natural skill that some people have, and some don’t. The article was entitled “The Myth of the Natural Born Teacher” by Elizabeth Green. This type of myth-making—that some folks are just “born to teach,” and others will hopelessly bore (at best) or (at worst), harm the learning of our students, is surprisingly prevalent, Green asserts, on not only both sides of the political spectrum, but nationwide in schools of Education. Yet considerable evidence exists, that, in fact, using particular skills and strategies result in increased levels of learning for students. This is fantastic news. Just as no one would want a “natural born surgeon,” teaching well is a learned skill, one that takes hard work, and willingness to adopt new strategies. For many teachers, the problem can be in sorting through the tremendous amounts of “noise” out there to find the best practices that will truly result in increased learning. In 2008, Monte-Sano compared two different types of teaching strategies for secondary Social Studies/History teachers. This research examined the writing skills of history students based on type of instruction. In this work, both teachers engaged in a mix of lecture, regular reading and writing assignments and some use of textbook reading. One teacher modeled active reading strategies, and encouraged students view history writing as an interpretive exercise, with the interpretation of historical documents as critical to creating meaningful and intelligent interpretations. The other teacher leaned toward teaching history as serious of static factual events. Monte-Sano found that those students whose teacher who relied more heavily on memorization of facts and assigned frequent essays, but provided limited feedback, had writing skills that stayed the same or even declined slightly over the course of the school year. However, students whose teacher gave consistent targeted feedback had students whose scores improved over the year. The teacher also engaged in traditional “English teacher” type reading comprehension and writing strategies, such as modeling, creating scaffolded opportunities for students to write, one-on-one conferencing and targeted feedback. In addition, students are pre-disposed to view history as a single story, and less likely to view history through the complex lens of interpretative art (Monte-Sano, 2012). Students come in to class “expecting” to hear a story with names, dates, and events they have to memorize, and may be more challenged to adapt to class that offers a truly college preparatory vision of historical writing. If we ask students to write interpretative essays, we are asking for a careful sifting of evidence and crafting of interpretation, which is some of the most complex writing required of students, and we are asking them to do it in History/Social Studies classes – not English classes! No wonder History and Social Studies teachers are feeling the heat. So what types of strategies should History teachers focus on in teaching Historical writing to students? The research suggests they should focus on the same high-impact strategies English teachers use, but adjusted for History/Social Studies. (5) Receive targeted feedback that encourages them to look at History and Social Studies as a way of asking lots of questions, rather then memorizing a set series of answers. These types of critical thinking skills are what will help our students to be successful readers and writers not only in high school, but in the university setting and beyond. This is just as true for us as teachers, as it is for our students: It’s not just WHO you are, but WHAT you do that will make a difference in student learning. Do we really want to teach our students any other lesson? Monte-Sano, C. (2008). Qualities of effective writing instruction in history classrooms: A cross-case comparison of two teachers’ practices. 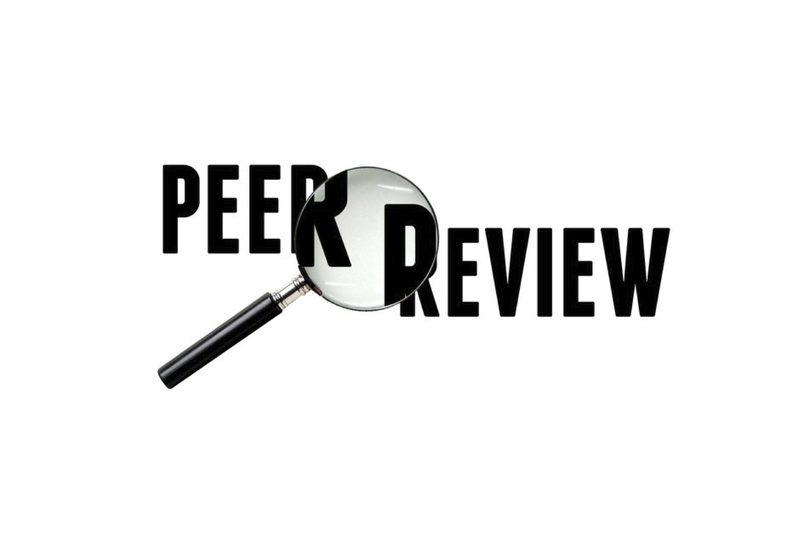 American Educational Research Journal, 45 (4), 1045-1079. For next time, I will look at some of the highest-impact writing strategies for English teachers, and see how they can be adapted for use by Social Studies teachers. If you can’t wait to get started, have a sneak peak at this important study for English teachers: A meta-analysis of writing instruction for adolescent students. The Document Based Lesson (DBL) is the third section of Abby Reisman’s award-winning dissertation. Avishag (Abby) Reisman lectures at the Teachers College at Columbia University and is an Assistant Professor at Penn. She won the Larry Metcalf Exemplary Dissertation Award from the National Council for the Social Studies (NCSS) in 2011. This post attempts to summarize pp. 124-168. The entire dissertation is a fantastic read for History geeks. This paper came out of a six-month intervention that was tested in five San Francisco schools. The Reading like a Historian program (RLH) created significant outcomes on student learning along four measures: (1) historical thinking, (2) factual knowledge, (3) general reasoning, and (4) reading comprehension. DBL requires students to engage in rigorous, open-ended historical investigations. The curriculum provided teachers with classroom-ready, sequenced lessons that were free. 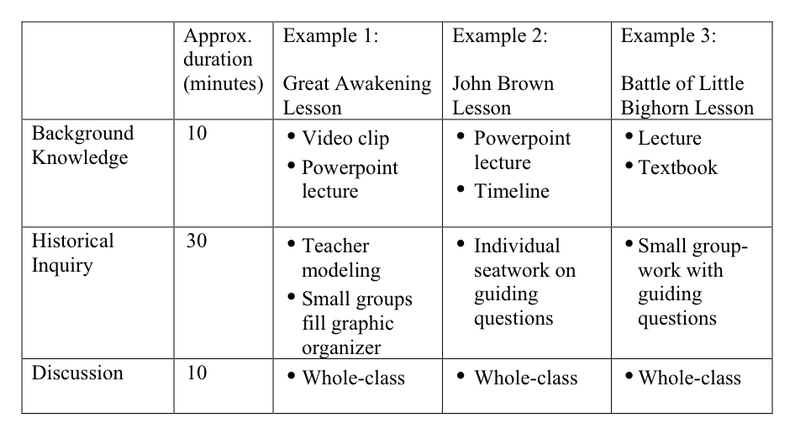 The activity sequence followed three distinct structures in the same order in each lesson: (a) establishment of background knowledge, (b) historical inquiry with multiple documents, and (c) discussion. Each lesson begins with a review of background knowledge via lecture, video, or textbook questions. Students read between 2-5 primary documents that examine a historical question from several perspectives. Documents offer conflicting interpretations. They are sequenced to make students change their minds. These conflicting accounts forced students to evaluate the level of truthiness (thanks Steven Colbert) in the claims, consider the context, and rationalize their judgments. Finally, students participate in a whole-class discussion around the central question and were required to use evidence from the documents to substantiate their claims. Teachers remain active leaders of classroom activities. They rely on sequences to review students’ content knowledge and to redirect discussion to the documents. Key to the program’s success was how DBL embedded historical inquiry into familiar structures and rearranged them into a repeatable instructional order. RLH simplified excerpts of primary source documents for presentation and focus. Each doc was presented in large font with lots of white space and no longer than 250 words. Then, RLH turned social studies teachers into reading instructors who delivered explicit strategy instruction. Students need to watch teachers repeatedly practice the strategies of disciplinary reading. 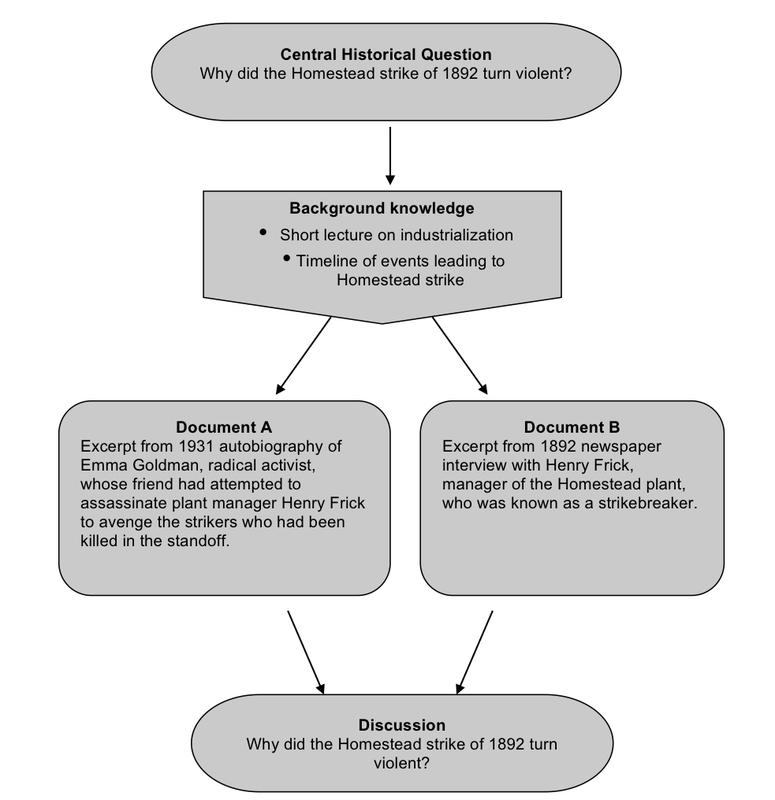 The DBL curriculum chose four strategies used by expert historical readers: (1) sourcing (considering the document’s source and purpose), (2) contextualization (placing the document in a temporal and spatial context), (3) corroboration (comparing the accounts of multiple sources against each other), and (4) close-reading (considering an author’s use of language and word choice. This lesson encompassed five activities in a 50-minute class period: video, lecture, teacher model, small group-work, and whole-class discussion. The activities all shared the goal of initiating students into the practices of historical inquiry. DBL mirrored reform efforts that have produced instructional change by providing extensive materials to support teacher change, clear and specific methods for instruction practice, and local facilitators whose job it is to coach teachers and ensure curricular fidelity. Teachers interested in adopting this model may get free lessons. When teachers, departments, and schools use writing from sources as formative assessments in History, protocols need to be followed before evaluating these assessments. Many departments or schools collaboratively grade these assessments during common planning time, or teacher professional development. This requires training evaluators in using validated rubrics before applying this knowledge to the analysis of student work. Teachers work together to identify exemplars that strongly correlate with the spectrum of work defined by the rubric. 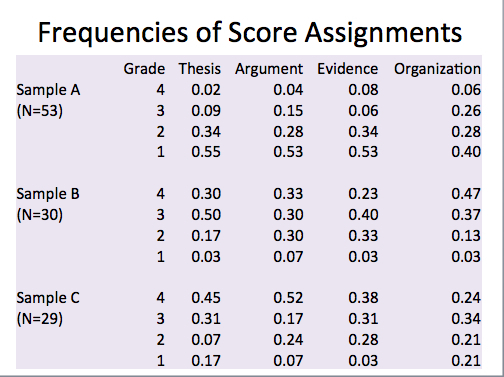 Holistic scoring involves assigning a single score that indicates the overall quality of a text (Bang, 2012). Raters give one summary score based on their impression of a text without trying to evaluate a specific set of skills. Analytic scoring examines multiple aspects of writing (e.g., content, structure, mechanics, etc.) and assigns a score for each. This type of evaluation generates several scores useful for guiding instruction. Broadly defined, reliability is the consistency with which an instrument/method produces measurements, while validity is the extent to which an instrument/method actually measures what it is meant to measure, or its accuracy. In testing writing rubrics, agreement rates are used to determine inter-rater reliability, where agreement is further defined as exact or adjacent scores. Exact agreement consensus rates need to be 70% or greater to be considered reliable (Stemler, 2004). Adjacent agreements within one score point should exceed 90% to indicate a good level of consistency (Jonsonn & Svingby, 2007). I used Google Forms to have my students validate the above rubric from the Literacy Design Collaborative. I found the LDC rubric to be more student friendly than the rubric my District adapted from the Smarter Balanced consortium. Jonsonn & Svingby (2007) analyzed 75 rubric validation studies and found (a) benchmarks are most likely to increase agreement, but they should be chosen with care since the scoring depends heavily on the benchmarks chosen to define the rubric; (b) agreement is improved by training, but training will probably never totally eliminate differences; (c) topic-specific rubrics are likely to produce more generalizable and dependable scores than generic rubrics; and (d) augmentation of the rating scale (for example so the raters can expand the number of levels using + or − signs) seems to improve certain aspects of inter-rater reliability, although not consensus agreements. Validating a rubric with your class gives your students additional time to consider their historical writing. When they have to review more than one student’s writing, they establish a context for evaluating their own writing. Class discussions should identify exemplars of strong historical writing. Direct instruction should focus on improving examples of weak writing. 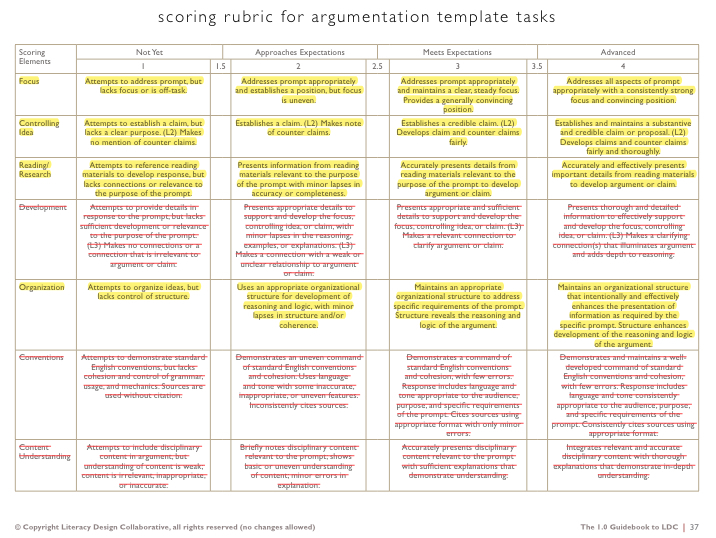 Rubric validation is a much-needed historical thinking exercise. Otherwise your students may develop what educational psychologists call the Dunning-Kruger Effect. The Dunning-Kruger Effect describes a cognitive bias in which people perform poorly on a task, but lack the meta-cognitive capacity to properly evaluate their performance. As a result, such people remain unaware of their incompetence and accordingly fail to take any self- improvement measures that might rid them of their incompetence. Bang, H. J. (N.D.) Reliability of National Writing Project’s Analytic Writing Continuum Assessment System. Kruger, J. & Dunning, D. (1999) Unskilled and unaware of it: How difficulties in recognizing one’s own incompetence lead to inflated self-assessments. Journal of Personality and Social Psychology, Vol 77(6), Dec 1999, 1121-1134. Stemler, S. E. (2004). A comparison of consensus, consistency, and measurement approaches to estimating interrater reliability. Practical Assessment, Research & Evaluation, 9(4).